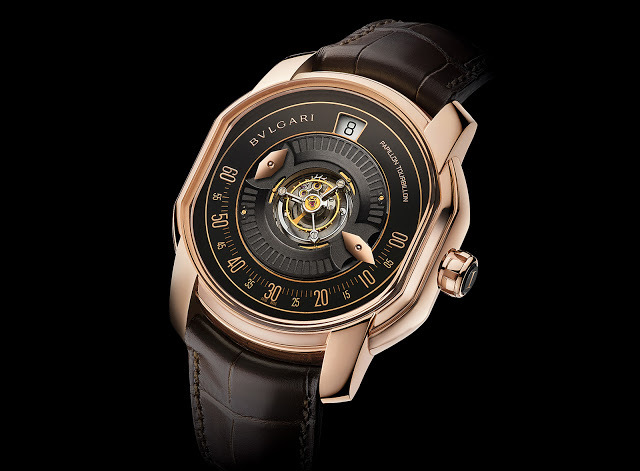 The novel jumping hour and wandering minutes complication from Bulgari now features a central tourbillon, in a limited edition of just 40 pieces. 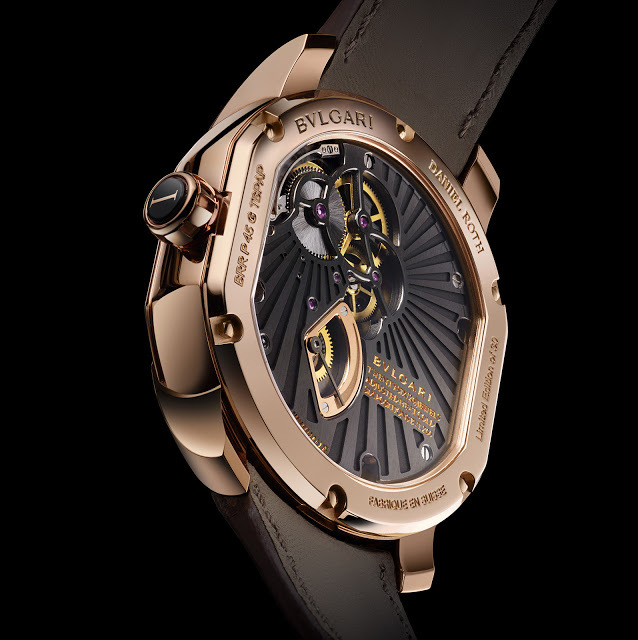 Originally developed by independent watchmaker Daniel Roth, the Bulgari Papillon is an innovative time display complication originally available as a time-only wristwatch, but now joined by a tourbillon right in the centre of the dial. 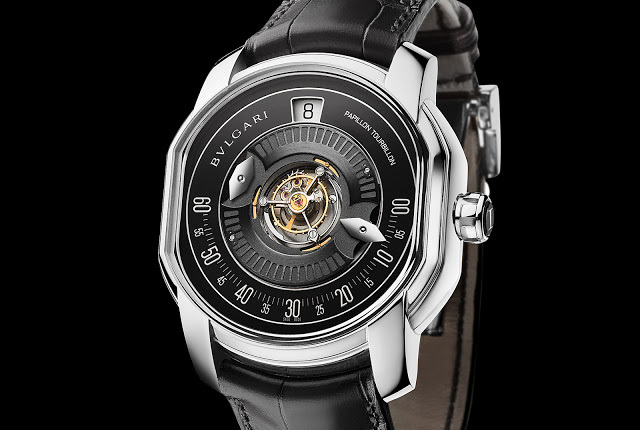 Flanked by the lozenge-shaped minute hands, the tourbillon is of the flying variety, meaning there is no bridge over it. Daniel Roth, who now makes watches as Jean Daniel Nicolas, invented the Papillon as a time display that resembles a retrograde minutes but instead using a Maltese cross mechanism similar to that found in the Urwerk UR-105. On the original Papillon a bridge over the dial covered the mechanism, leaving only one minute hand visible at a time, hence the similarity to a retrograde minutes that flies back to zero at the top of the hour. 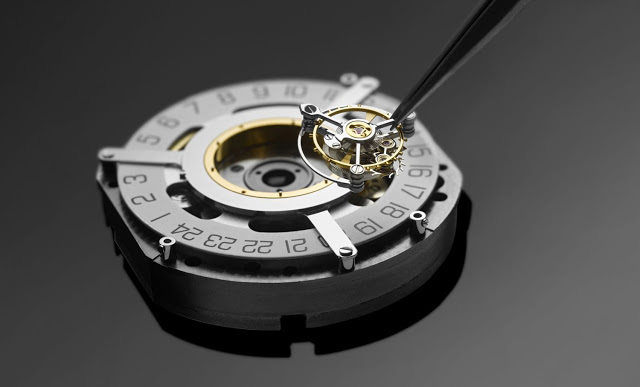 Though mechanically identical, the new Papillon reveals both minute hands, which are made of 18k gold. The minutes are shown on the semi-circular track running from three to nine o’clock. As one minute hand retracts, the other simultaneously extends at the other end of the minute track. An aperture at 12 o’clock shows the hours with a jumping disc display. Hand-wound with a 60 hour power reserve, the in-house movement is visible through the display back. The case measures a hefty 45mm in diameter, with a sapphire crystal that sits directly on the case band, without a bezel. This is available in platinum in a run of just 10 pieces, or in pink gold in a 30-piece limited edition. 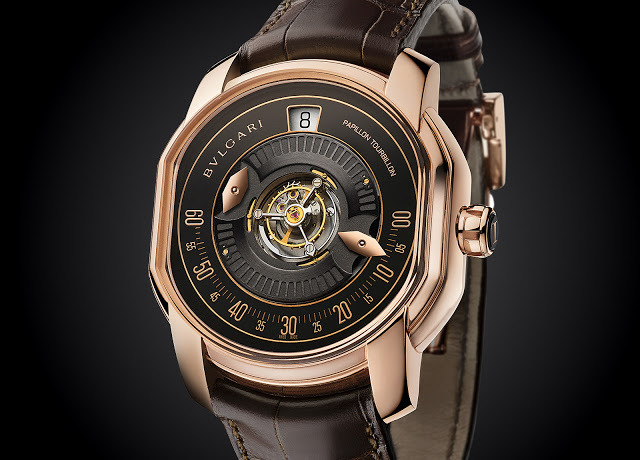 The pink gold version costs US$129,000, and in Singapore it’s S$177,000 including GST. And in platinum it’s US$139,000 and S$191,000 respectively. Addition October 27, 2015: Updated to include prices.